JazzInk: Soul Cafe: Grand Finale? Soul Café merges the unusual instrumentation of piano, sax and guitar with poetry. As members of the Hennepin Avenue United Methodist Church, guitarist Steve Blons and alto/bari saxman Brad Holden did a few duo performances for the congregation as “Jazz Meditations.” Soon they added poetry readings to the music and planned a monthly schedule with guest artists. Pianist Laura Caviani was the first guest. She never left. The church setting may reinforce the spiritual quality of words and music, yet the gathering transcends religious boundaries and dogma, bringing a diverse audience together each month united in art. The trio has presented themes as broad as “Love” or “Beauty” and as focused as pairing the music of Rogers and Hart with the poems of Pablo Neruda. 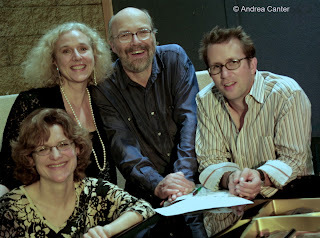 Sometimes they invite a guest, often vocalist Lucia Newell with whom the group recorded their second CD, The Poetry of Jazz. Steve Blons summed up the trio’s approach to the music in an interview a few years ago: “We began experimenting with two-part and three-part improvisation, with dropping out to leave just a duo or a solo voice. We rehearse very little and play mostly new material each time, so our interpretations and choices are very fresh. We enjoy the risk and adventure of this kind of music.” And so does their audience, largely members of the HAUMC congregation who might not necessarily gravitate toward Monk or Mulligan otherwise. Tonight, Soul Café made it a special, if final, occasion. First there was the cake, lettered “Congratulations, 7 + 65.” Seven for seven years of performance; 65 for Steve’s birthday. And they might have added “10” as well, as Steve’s wife Jan, who has coordinated the poetry through seven seasons of concerts, was celebrating ten years since a cancer diagnosis and a few days since her oncologist told her she did not need further follow-up. Aside from an opening reading of a poem from Rilke, each jazz selection was followed by an e.e. cummings reading. The trio started out with the bittersweet Charlie Chaplin standard, “Smile,” a perfect introduction to the three reasons this ensemble soars each month. Piano, sax and guitar may be an unusual blend but not for lack of harmonic elegance. Brad Holden plays alto sax like no one else around here, swinging with a Paul Desmond sweetness that makes vocals superfluous (although he does sound great with Lucia Newell!). Steve Blons provides further goosebumps via un-amped acoustic guitar, while Laura Caviani never fails to find the improvisational opportunities in each crevice of melody, sometimes pushing the trio to full throttle, sometimes pulling it back into subdued revelry. But the totality here is greater than the sum of its parts, and each solo flows seamlessly into the next and into the group voice. The familiar “Smile” was followed by a less familiar Lennie Tristano composition on the chord changes to “Out of Nowhere” (“317-32nd Street East” if I have the right address), which was followed by a dramatic take on Monk’s Misterioso, my first opportunity to hear Brad on baritone. Laura led off with an appropriately quirky solo introduction, and as the guys came in, the bari sax chugged the bassline like a slinky tuba. But from that point it became a romping blues, Steve riffing on lines from Gershwin, Brad conjuring James Carter-ish growls and honks, Laura catapulting across blue lines until the trio came full circle, ending on Monk’s familiar theme. I was captivated by Laura’s original, swinging “Yes, We’ve Met” when I first heard it during their live in-studio recording for The Poetry of Jazz, the one tune on that CD not written by Rogers and Hart. It was a fitting addition to the playlist tonight, starting (and ending) with the three voices in unison and a lovely duet exchange between sax and guitar. The last bow followed Gerry Mulligan’s “Line for Lyons,” Brad again picking up the bari, each musician taking a brief personal journey before they joined together one last time. Applause, a series of thank yous, and Steve hinted that there might be some special reunions in the future, maybe at other venues. Fortunately, two CDs help to preserve this collaboration, but many of us will miss this monthly ritual, music without amplification, performed simply for the love of the sounds and the partnership, creating a community of listeners under the spell of the poetry of jazz. If you are interested in either or both of Soul Café’s recordings, contact Steve Blons at bodysoul@earthlink.net.